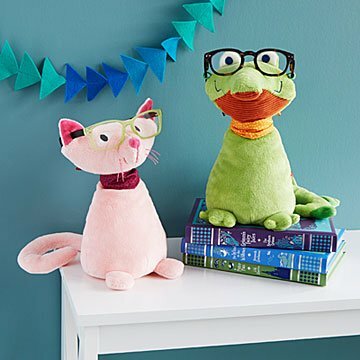 These adorably goofy, plush critters will keep a kiddo’s specs safe at their bedside as they slumber. Kiddo: Tell me a story before I go to sleep! You: OK. Once upon a time, there was a nearsighted crocodile who lost his glasses. Oh no! Everything was blurry! Luckily, his friend, the astigmatic cat, found them. Yay! The two friends decided to devote themselves to helping others hold on to theirs. Put little specs on one of these plush pals to keep safe and sound until morning. Designed in Germany. Made in China.